Welcome to your first independent, functional kitchen! We’ve talked about the gear, you know the rules, now it’s time to stock the larder. But let’s be strategic about it. 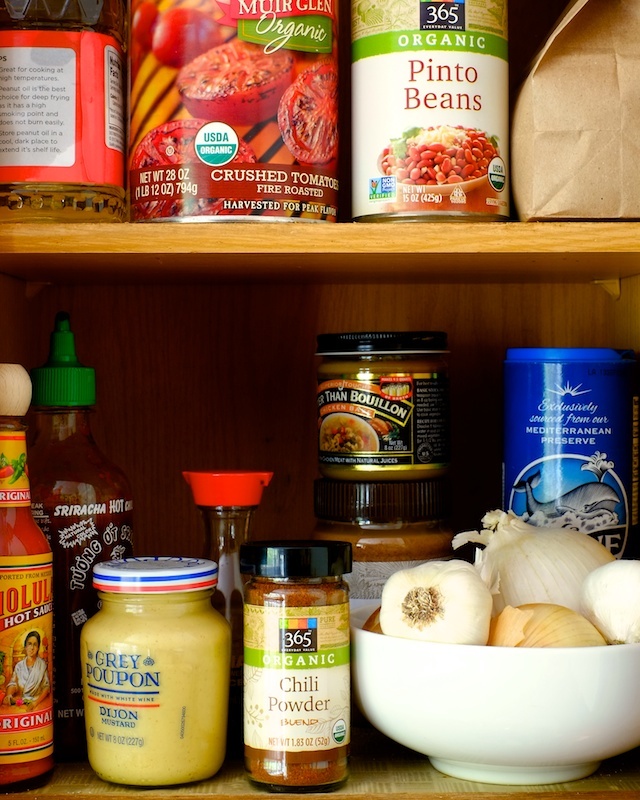 For your very first pantry we need to keep things minimal and manageable, but smart and versatile. We need foods that will last a long time, because study groups and parties will pop up, and responsibly-planned dinners will be overruled. We also need foods that are real, inexpensive, nutritious, and easy to prepare. It’s a tall order, but it can definitely be done. This proposed plan revolves around complex carbs, affordable proteins, frozen fruits and veggies (they last the longest), and a powerhouse list of flavor-enhancers. This is not a diet plan, and I don’t recommend eating the foods on this list exclusively (I’d be tired of it after a month or so), but it’s a really solid starting point that you can return to a few times a week to keep your food expenses in check. I’ve also developed a list of easy, tasty recipes that can be made using only the items on this list, which is really nice for those days when you’re out of cash and you have to rustle something up on the fly. Because I love you, I went to the trouble of pricing out the entire list at Whole Foods in Annapolis so you could have an idea of what a worst-case scenario total cost might be. Whatever products Whole Foods didn’t have (or that I added to the list later), I priced at Wegmans. -Toast and eggs, in any iteration. Scrambled egg sandwich, over-easy with hot sauce, omelet with cheese – the possibilities are abundant. And if you think you don’t like eggs, it might be because you don’t like the way your mom makes them. Experiment with different egg preparations because the flavor changes massively with each one. –Pasta with simple tomato sauce. Add garlic and italian seasoning (and parmesan cheese) for a more traditional plate of spaghetti.